Amenemhat III, also spelled Amenemhet III, was a pharaoh of the Twelfth Dynasty of Egypt. 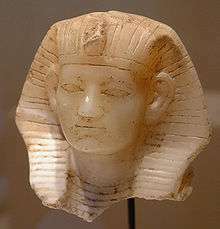 He ruled from c.1860 BC to c.1814 BC, the highest known date being found in a papyrus dated to Regnal Year 46, I Akhet 22 of his rule. His reign is regarded as the golden age of the Middle Kingdom. 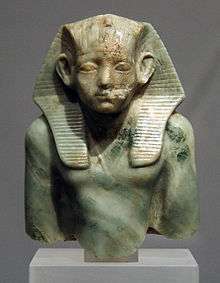 He may have had a long coregency (of 20 years) with his father, Senusret III. 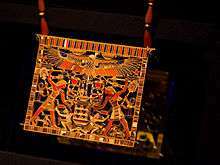 Pectoral of Amenemhat III, tomb of Mereret. Pyramidion or Capstone of Amenemhat III's pyramid. The mortuary temple attached to the Hawara pyramid may have been known to Herodotus and Diodorus Siculus as the "Labyrinth". Strabo praised it as a wonder of the world. The king's pyramid at Hawara contained some of the most complex security features of any found in Egypt and is perhaps the only one to come close to the sort of tricks Hollywood associates with such structures. Nevertheless, the king's burial was robbed in antiquity. His daughter or sister, Neferuptah, was buried in a separate pyramid (discovered in 1956) 2 km southwest of the king's. 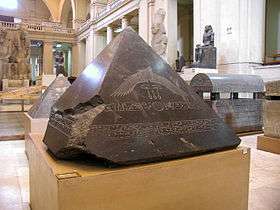 The pyramidion of Amenemhet III's pyramid tomb was found toppled from the peak of its structure and preserved relatively intact; it is today located in the Cairo Egyptian Museum. There is very little evidence for military expeditions in the reign of the king. There is only one record for a small mission in year nine of the king. The evidence for that was found in a rock inscription in Nubia, near the fortress of Kumma. The short text reports that a military mission was guided by the mouth of Nekhen Zamonth who reports that he went North with a small troop and that nobody died when going back South. During his long rule Amenemhat continued the work probably started by his father to link the Fayum Depression with the Nile. The area had been a mere swamp previously. A canal 16 kilometres (9.9 mi) and 1.5 kilometres (0.93 mi) wide was dug, known as Mer-Wer (the Great Canal); it is now known as Bahr Yussef. The banks for the central deep side were at a slope of 1:10, to allow the use of non-cohesive soil and rock fill. A dam called Ha-Uar run east-west and the canal was inclined towards the Fayum depression at the slope of 0.01 degrees. The resultant Lake Moeris was able to store 13 billion cubic meters of flood water each year. This immense work of civil engineering was eventually finished by his son Amenmehat IV and brought prosperity to Fayum. The area became a breadbasket for the country and continued to be used until 230 BC when the Lahun branch of the Nile silted up. Amenemhat III is, together with Senusret III, the best-attested Middle Kingdom king by number of statues. About 80 statues or fragments of statues can be assigned to him. 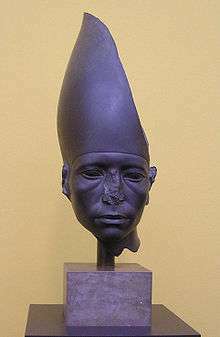 The sculpture of Amenemhat III continued the tradition of Senusret III. Many of his works no longer represent a young, idealized king, but instead an expressive physiognomy, showing signs of age. There is an amazingly wide range of stones used for the sculpture of the king, not attested for any king before. Furthermore, the king introduced several new types of sculptures, many of these types inspired by older prototypes, dating back to the early Dynastic Period. There are two facial types that can be assigned to Amenemhat III. ↑ Callender, Gae (2003). "The Middle Kingdom Renaissance". In Shaw, Ian. The Oxford History of Ancient Egypt. p. 156. ↑ Kim S. B. Ryholt, The Political Situation in Egypt During the Second Intermediate Period, C. 1800-1550 B.C., Museum Tusculanum Press 1997, pp.211f. ↑ Lehner, Mark (2001). The Complete Pyramids: Solving the Ancient Mysteries. London: Thames & Hudson. p. 182. ISBN 0-500-05084-8. ↑ Callender, Gae (2003). "The Middle Kingdom Renaissance". In Shaw, Ian. The Oxford History of Ancient Egypt. p. 158. ↑ Callender, Gae (2003). "The Middle Kingdom Renaissance". In Shaw, Ian. The Oxford History of Ancient Egypt. p. 157. ↑ El-sayed Mahfouz (2010). Amenemhat IV au ouadi Gaouasis. BIFAO. 2010:110 pp. 165–173. ↑ Chanson, Hubert (1999). Hydraulics of Open Channel Flow. Edward Arnold/Butterworth-Heinemann. ISBN 9780750659789. ↑ Simon Connor: The statue of the steward Nemtyhotep (Berlin ÄM 15700) and some considerations about Royal and Private Portrait under Amenemhat III, In: G. Miniaci, W. Grajetzki (editors): The World of Middle Kingdom Egypt (2000–1550 BC) Contributrions on Archaeology, Art, Religion, and Written Sources. Band 1, Golden House Publications, London 2015, ISBN 978-1-906137-43-4, 58-64.